This Simulated Aquamarine tennis bracelet is the perfect choice for ladies who love blue. 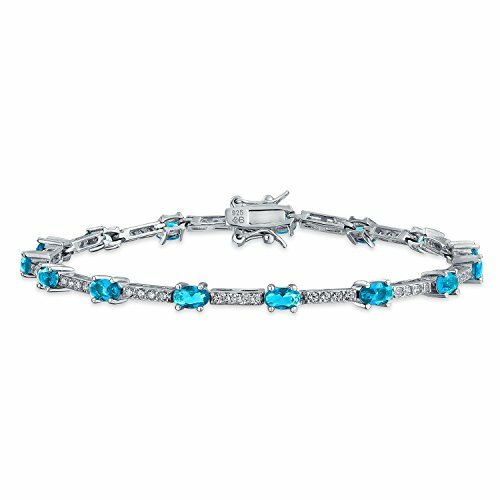 Our stunning blue bracelet is made up of fourteen oval cubic zirconia Simulated Aquamarine colored stones in four prong settings, alternating with links containing a sets of four pave clear cubic zirconia stones. This sensational sterling silver tennis bracelet combines a light feel with a secure box clasp . The rhodium plating will keep the high polish looking new for many years to come. Perfect for friends born in March, this stunning Simulated Aquamarine bracelet is a striking and affordable piece of jewelry for your collection. A gorgeous choice for a March birthday, this sublime .925 silver tennis bracelet will add sophisticated elegance to any style. Featuring an alluring, feminine design of simulated aquamarine, blue colored, oval cz's and links of shimmering pave cz's. Caperci Sterling Silver Created Gemstone Blue Sapphire Love Mom Bolo Bracelet for Women Mom, 9"
Oval-Cut Multi-Color Genuine Gemstone 10k Yellow Gold Tennis Bracelet 7.25"